From CEOs of major corporations to the simply time poor, a business jet has become a necessity of modern life for many but there’s no denying that, while time efficient, flying by private jet is a costly undertaking that doesn’t do any favours for the environment either. However, if your travels rarely take you any further than Europe for those on the continent or you are an American who mostly flies within the States there is another option. 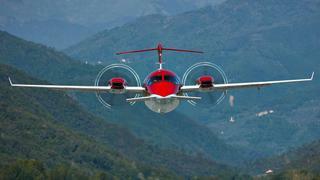 The Avanti Evo, the third generation of Piaggio Aerospace’s P.180, is a turboprop which not only offers comparable speeds to jet planes in its class but also cuts CO2 emissions by up to 40% compared to other light aircraft. Originally launched over 25 years ago, the Avanti Evo has gained the moniker ‘Ferrari of the skies’ in its native Italy thanks to a highly aerodynamic design that allows it to cruise at a zippy 402 knots with an altitude of 41,000 feet. A max range of 1,809 nautical miles, meanwhile, is enough to take you from London to Moscow. Inside, the light and airy cabin boasts a headroom of 1.75 metres so only those of basketball playing stature need feel cramped and, once strapped into one of the eight roomy leather seats, space abounds. The day of my test flight was extraordinarily windy and, while inevitably some buffeting would be felt in a plane of this size, the Avanti Evo dealt with it admirably. Most notable was the speed of ascent. The Avanti Evo needs just 974 metres of runway to take off (for comparison a Boeing 747 needs around 1,500 metres) and once climbing we were above the clouds and at cruising altitude within minutes. After 30 minutes cruising above the south English coast on a gloriously clear day we landed back in Biggin Hill without the slightest hint of a bump and, for quick jaunts to the continent, it can't be denied there are worse ways to fly. There is no getting away from the fact, however, that this is a small plane. The toilet facilities are far from palatial and there is no comparable galley space to those found on larger business jets. 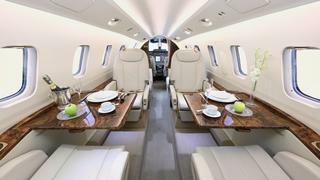 Thankfully Connectjets, the broker which has exclusive listing of the Avanti Evo in the UK, has found a way around this with a host of partner brands just waiting to kit your plane out in the utmost luxury. First — and perhaps most importantly for a first class flying experience — is food and drink. Connectjets works with Absolute Taste and The Aviation Nutritionist to offer healthy, balanced and delicious dining options, which aid digestion so you feel energised rather than sluggish upon arrival. Options include herb rubbed rump of lamb with dauphinoise potatoes, crispy seasonal vegetables and thyme jus, and seared sea bass fillet with new potatoes, asparagus, broad bean and pea salad with a lemon beurre blanc sauce. But, of course, what is a meal without a delicious bottle of wine? Honest Grapes specialises in the best wines for private jets by hand-picking bottles whose flavour develops, rather than diminishes, at altitude and even curates private flight packages featuring everything you need for the ultimate on-board drinking experience. For the all-round VIP experience allow Castle Air helicopters to ferry you from London to Biggin Hiil — a short but completely thrilling ten minute journey — and pack all your essentials into an exquisite leather holdall from new Mayfair-based brand LONB. Its impeccably designed modular bag system is the revolution the luggage industry has been waiting for. 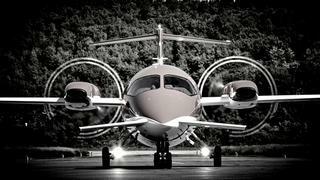 The Piaggio Avanti Evo is priced at $7.4 million and is available exclusively through ConnectJets in the UK. Visit connectjets.com.